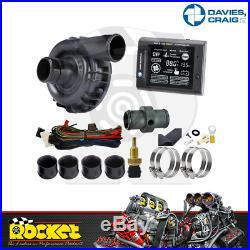 Davies Craig 115L/min Electric Water Pump & LCD Controller Kit - DC8930. 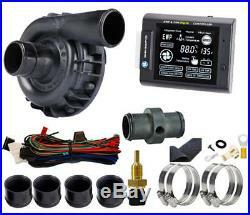 EWP & LCD Controller Kit Nylon Electric Water Pump - 115 Litres/Min Suit Engines 6-8 Cyl Over 400 HP & Heavy Duty 4WD's. The EWP115 and LCD EWP & Fan Digital Controller Combo â?? Simple, do-it-yourself, easy to install, designed to complement or replace your existing belt-driven, mechanical water pump and engine thermostat. The EWPÂ®115 will fit most vehicle makes and models fitted and excel on large six-cylinder, V8 engines. The LCD EWPÂ® & Fan Digital Controller is scientifically calibrated to manage the flow rate of engine coolant to lock onto a targeted engine temperature. The unique LCD EWP/Fan Digital Controller will manage the operation of your chosen EWP by varying the speed of your pump in response to coolant temperature and manage control of your electric Thermatic Fan, No need for a separate thermal switch. The Controller varies the speed of your EWP looking for, and locking onto your target temp. If the engine temp goes 3 degrees C over the target, the Controller will run your radiator fan until the target temp is restored. And it now does 12 & 24 Volt. This LCD EWP/Fan Digital Controller (Part #8001) is Australian designed and as part of this Australian manufacturing companyâ?? S continuous improvement program this advanced Digital Controller boasts a suite of enhancements. The prominent blue Liquid Crystal Display screen (pictured). Now suitable for all 12v & 24v electrical systems, with relevant displays. Genuine Thermometer, with coolant and targeted/set temp. Diagnostic check & warm-up signals. Nine (9) targeted/set coolant temperatures, 60C (140F) to 100C (212F). Logo signifying water pump in operation. Davies Craig Thermatic Fan logo, circulating signifying fan in operation. Flashing High & Low Voltage indicators. Low & High Temp indicators. T exceed 40ÂºC (104ÂºF) within 5 mins of start-up. When coolant temperature exceeds 10ÂºC (50ÂºF) of set/target. When coolant temperature exceeds 100ÂºC (212ÂºF). Above Set/Target Temperature indicator accompanies audible alarm. Temperature Sensor short & open circuit indicators. Automatic time-out, EWP runs for 3 minutes or until engine temp has reduced to -10â? ¦C (-14F) below set/targeted temp whichever occurs first. The updated Davies, Craig LCD EWP/Fan Digital Controller (#8000) as an engine management component has undergone extensive research, development, vehicle and test centre scrutiny. The updated LCD Digital Controller how has two specific functions. This unique Controller will now manage the operation of the EWP by varying the speed of the EWPÂ® in response to the temperature of the engine and manage control of your electric engine fan. The Controller has a push-button on the facia panel that offers target temperatures, 60ÂºC (140Â°F) 65ÂºC (150Â°F) 70C (160Â°F) 75ÂºC (165Â°F) 80ÂºC (175Â°F) 85ÂºC (185Â°F) 90ÂºC (195Â°F) 95ÂºC (205Â°F). Generally, higher engine temperature will offer improved fuel efficiency and lower engine temperature more power. The LCD Digital Controller will now operate the engineâ?? S electric fan automatically once the engine has reached +3c above the target temperature. A significant benefit too is the Controller allows the EWP to run on after ignition shutdown to reduce heat soak. The LCD Digital Controller can be used with our EBP however it is not recommended as it will not vary the speed of the pump in response to temperature but rather simply turn the pump on and off once the top end temperature is reached. For a far more economical & appropriate solution, we would recommend Part Number 0401 & 0444 to turn the EBP on and off at your set temp. Note: This controller Part No. 8000 is set up for negativley earthed systems however with a wiring adjustment, can also handle positive earthed systems. Rocket Industries Pty Ltd ships goods Internationally and Australia wide. Under no circumstances will parcels be left unattended or without a signature from the receiver. Bank Transfer Below is our bank transfer details. Goods that are short supplied must be referred to Rocket within 7 days of receipt. Monday to Friday: 8.00am - 5.30pm Saturday: 8.00am - 1.00pm. Rocket Industries is the largest distributor of performance products and accessories in Australia, stocking over 300 leading brands of performance parts & accessories. With brands such as Aeroflow, Autometer, B&M, Edelbrock, K&N, Mickey Thompson, MSD, Comp Cams, Simpson, JE, SRP, Weld Racing and more. We are serious about supplying you with reliability of stock and the right parts, right when you need them. Our depth of knowledge and understanding of the performance industry reflects in the pride and winning attitude of our team at Rocket. We are a genuine warehouse distributor which has been in operation for more than 30 years, stocking products from over 300 leading manufacturers from around the world. We have established supply chains from overseas which enable fast and reliable service with part sourcing without all the headaches and hidden charges. We are constantly improving customer service and investigating new products to help you keep pace with, and be competitive in the ever changing automotive market. Rocket Industries is the largest distributor of performance products and accessories in Australia, stocking over 300 leading brands of performance gear. The item "Davies Craig 115L/min Electric Water Pump & LCD Controller Kit DC8930" is in sale since Tuesday, May 23, 2017. This item is in the category "Vehicle Parts & Accessories\Car & Truck Parts\Cooling Systems\Water Pumps". The seller is "rocketind" and is located in HUNTINGWOOD. This item can be shipped worldwide.